Josh Kyle is one of those rare singers with the heavenly voices that seem to be flying over their audience, inviting them to fly along and see the world from up high. Together with the gentle giant Sam Keevers, they gave us a wonderful album last year, suggesting what would be a set of modern Australian jazz standards. 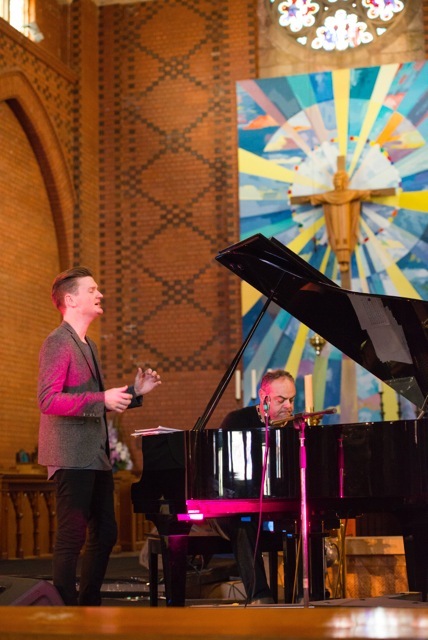 Prior to the duet’s upcoming concerts, the vocalist was keen on sharing his insight into this fruitful collaboration, his experience in the UK and the state of the Melbourne scene. AustralianJazz.Net: How would you describe your artistic relationship with Sam Keevers? Josh Kyle: Working with Sam on this project has been really amazing. Sam is a hugely gifted pianist/ composer in his own right, but is equally gifted accompanying singers. I can remember hearing him play on the Live Vince Jones record when I was growing up and even today I still hear how creative and accommodating his playing is of the voice. Writing lyrics to some of Sam’s tunes has also been really great, he has supported all my ideas and really helped bring this concept together. This will be something we keep working on for a long time, adding new material as we go. AJN: What should anyone expect from your concerts? JK: Really open, stripped back story telling. The collection of tunes were originally of interest to me because they are all really beautifully written and the melodies were so strong. Having this as a backbone to add lyrics to made the task not just easier but really enjoyable. We are not trying to over complicate things or get in the way of the melodies, it’s about enjoying the music and showcasing some really great Australian composers! AJN: What is it that you most enjoy, performing at such an intimate setting? JK: A lot of the projects I had been involved with, prior to “Songs Of Friends”, had been with larger ensembles, which I love and will continue to do, but when deciding how to treat the music I felt it really important to make it as intimate as possible. Really showcasing the compositions was always the main goal. I think whilst duo performance is exposing, it’s also very liberating, as you have a lot more space to play and work with. Taking inspiration from the Bill Evans & Tony Bennett duo records, they didn’t need anything else and thats something I wanted to try and explore, how to create something big in a small setting – something ill be working on for a long time I think. AJN: If you could have any artist you’d like to come join you and form a trio, who would that be? JK: This is a tough question; I think it would be really wild if someone like Joe Lane joined us on a few tunes. He would be totally inspiring and kicking my arse the whole time. He was a great singer and story teller! JK: Vince Jones has always been my number one; I honestly listened to the live album almost everyday as a 14 year old; he really is the reason I’m singing. I didn’t understand why i liked it, or why he was so good at the time, I just knew I wanted to do and sound like that. Then its all the greats: Jimmy Scott, Mark Murphy, Carmen McRae, Betty Carter, Jon Hendricks. All these singers dug in a little harder found something deeper in my opinion. AJN: What have you gained from your experience in the UK? JK: My time in the UK was hugely important and I have gained a lot. Graduating from University and heading abroad meant that I was no longer someone’s student, someone’s class mate; I wasn’t trying to get gigs my lecturers were also chasing, first impressions were on my terms. This taught me a lot about what I was capable of and what I needed to work on, what I valued artistically and started to formulate my individual sound. With a larger population and connections to Europe meant I had a lot of great opportunities to work with great musicians at such an early stage of my career. AJN: How would you compare that experience to playing in Australia? JK: I think in particular the Melbourne music scene is very strong and varied. There is so much great music being produced here and I have learnt so much since returning to Australia. I think it’s easy to think that all the good music is being made overseas when it really isn’t the case. Great music is being written and played here in Australia with some really innovative ideas. I’m really into whats happening locally at the moment – another reason why this project exists. AJN: How did you manage to find your own voice as a singer? JK: Trial and error, which is still continuing. I think I’ll always be trying to find my own voice, but through varied creative projects and experiences, testing my limits and pushing them is how I think you start to formulate a “sound”. I decided early on that I wasn’t concerned with recording albums that all sounded the same or tried to conform to one idea what vocal jazz was or is; I wanted to follow my nose (or ears) and make music I was interested in. JK: Fairly cliched, but I just want to be in a position where I can continue to create and be apart of interesting musical experiences for many years to come. JK: To me, jazz is a set of freedoms, a platform for creativity and experimentation. It can truly be anything, which is why it’s exciting.